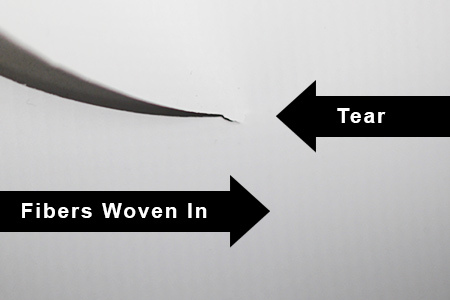 The material that is used to produce banners has a woven fiber within that gives the banners their extra strength. Cutting wind slits into the banner cuts these woven fibers and damages the integrity of the banner, causing it to rip faster than normal. Are you looking to put up a banner in a high wind location? Your best option is a mesh banner! 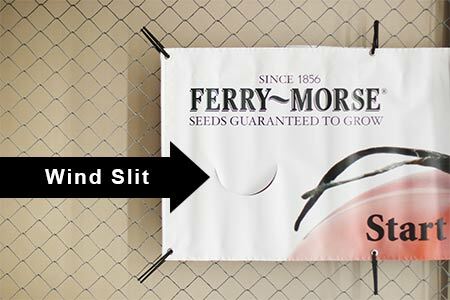 Our mesh banner material has a 37% air-flow, which allows the air to easily pass through. Mesh also allows you to see the whole image at all times so you don't have to worry about people only getting part of your intended message. Order a mesh banner instead of using wind slits. It will last longer and your target audience will be able to clearly see your entire message at all times!